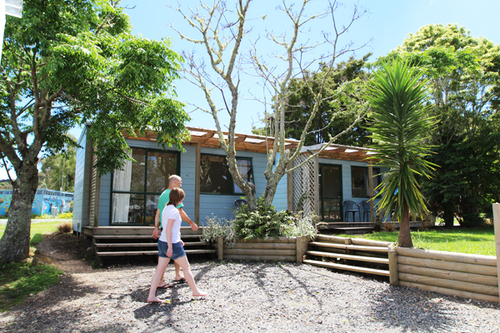 With over two hectares available, guests can choose a spacious site with bay and/or native forest views. BBQ area with outdoor seating. Please bring or hire a gas bottle. 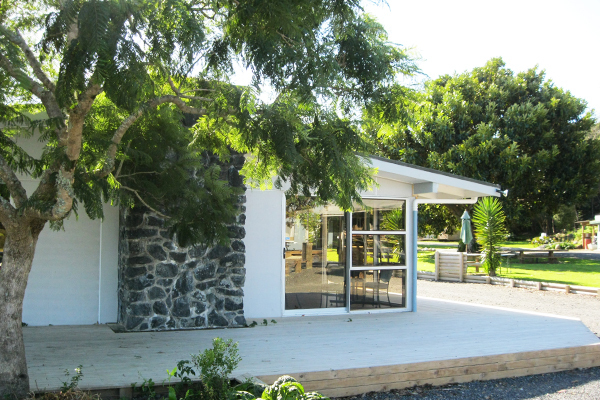 Situated in a private setting which takes advantage of the abundant trees, plantings and birds to be found at Russell - Orongo Bay Holiday Park, the Eco Chalets have their own private deck overlooking Orongo Bay and a BBQ can be requested for use. 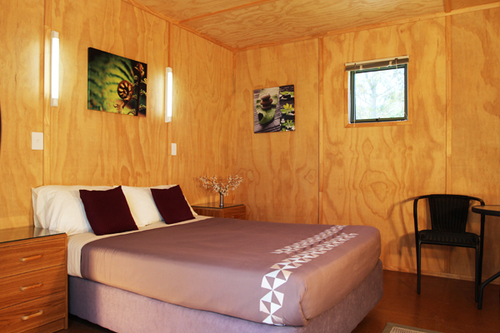 Our chalets are designed to employ sustainable eco – friendly systems, including low energy lighting and environmentally friendly wastewater treatment. Chalets have a TV/DVD, a kitchenette and a bathroom. The Kitchen lodge rooms have cooking facilities and all crockery, pots and utensils. There is a fridge and table and chairs. You will have use of our shared bathrooms together with our large communal area which features a huge stone open fireplace, lounge with television and dining area. Bottom sheet, pillow and pillowslip are provided. Please bring your own duvet/sleeping bag and towels. 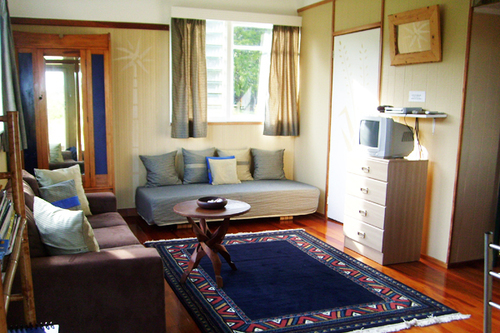 Rate inclusions: Kitchenette with medium fridge, cutlery, crockery and cooking equipment for 4 people. Dining table & chairs. 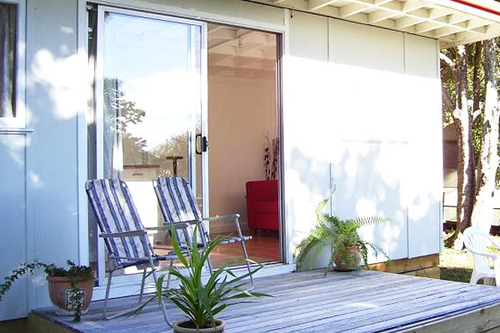 The Standalone Family cabin is complete with it's own good sized deck. The cabin has a small fridge with tea and coffee making facilities. 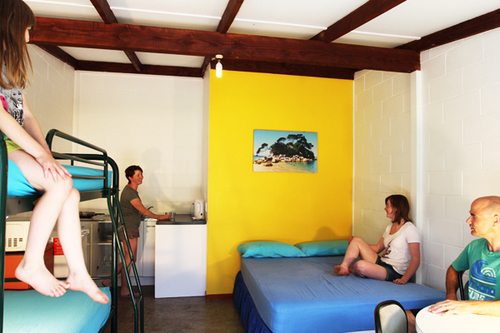 The communal kitchen are shared bathrooms are available near your cabin for your convenience. Full Bedding is provided - please bring your own towels and cooking equipment, crockery and cutlery..
Our quality New Zealand made canvas tipi overlooks Orongo Bay. The height and space when you are inside the tipi is quite an experience - more substantial and spacious than a traditional tent. 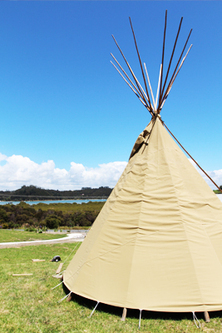 Our tipi has a liner which means it is well insulated – cool in summer and warm when the weather is cool. All bedding is provided, please bring towels together with a picnic basket with your crockery and cutlery. Dont forget to bring a torch, towels, crockery & cooking equipment or you can hire some from us. 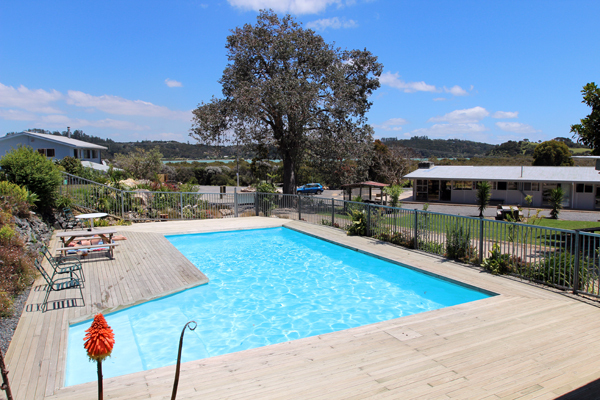 With over two hectares available, guests can choose a spacious site with bay and/or native forest views. Many sites are quite private. A camp kitchen is nearby. Please bring your own kitchen equipment, crockery and cutlery. 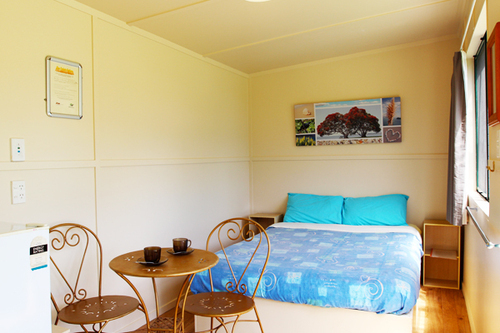 Standalone cabins come with their own deck and outdoor seating and all bedding is provided. The cabin has a small fridge and tea and coffee making facilities. Full Bedding is provided - please bring your own towels and cooking equipment, crockery and cutlery. The swordfish cottage was originally located on Russell Wharf as the original swordfish club before it was relocated to Orongo Bay. The cottage is situated in a private setting which takes advantage of the abundant trees, plantings and birds to be found at Russell - Orongo Bay Holiday Park, the private and self contained cottage has spacious decks with views over Orongo Bay. It has a private courtyard (BBQs available by request) and is also enclosed by low gates – ideal for small children . The cottage sleeps 8 people comfortably (3 bedroom areas and 1 sofa bed) and there is a mezzanine space for a more fun sleeping/play option. The cottage has a private bathroom and full kitchen with oven, hotplates, fridge, crockery and cutlery. 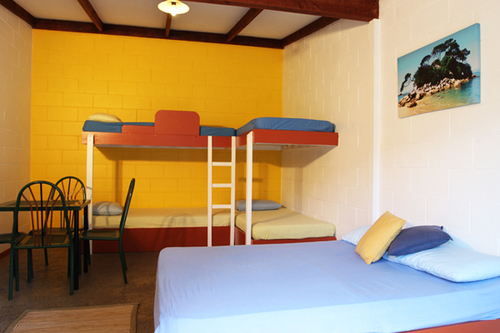 Double bed in main bedroom, bunk beds in 2 further bedroom areas and a sofa bed in the lounge. There is also a functional mezzanine area for the kids to play/sleep. The Bach has it's own deck, kitchen with fridge, microwave, jug toaster, crockery and cutlery and a lounge area with a sofa bed. Guests use shared bathroom facilities. The Bach sleeps 2, but extra guests may use sofa bed in lounge area (please enquire). Full Bedding is provided - please bring your own towels. Situated in a private setting which takes advantage of the abundant trees, plantings and birds to be found at Russell - Orongo Bay Holiday Park, the self contained Bungalow has indoor/outdoor living in a private bush setting with loads of birdlife. Featuring two bedrooms each with double bed, a good sized deck with BBQ, a lounge with TV and built in sofas which convert to a double bed. You also have your own bathroom and a full kitchen with oven, hotplates, fridge, crockery and cutlery. Rate inclusions: All bedding including pillows, sheets and duvets. Towels supplied with en-suite bathroom. Full kitchen with oven, large fridge and all equipment for up to six people. BBQ on deck. Bedding, towels, crockery, cutlery, cooking equipment. The lodge rooms are spacious and have their own fridge and table and chairs. You will have use of our large communal area which features a huge stone open fireplace, lounge with television, dining area and kitchen (please bring your own crockery and cutlery or hire from us). Bottom sheet, pillow and pillowslip are provided. Please bring your own duvet/sleeping bag, towels, kitchen equipment and crockery and cutlery..
You will discover the perfect campsite to pitch your tent, park your campervan or enjoy a stay in one of our cabins or cottages. Whatever your budget we have accommodation to suit your needs. 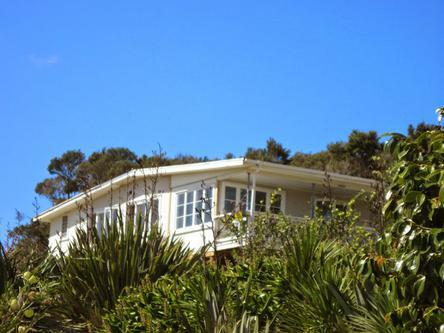 Russell - Orongo Bay Holiday Park is an authentic kiwi holiday park in the kiwi tradition and appeals to New Zealand families and international visitors alike. 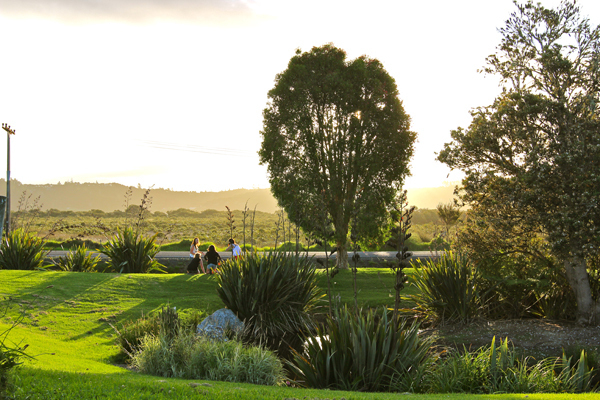 Located close to Russell, the Park is set in 14 picturesque acres in a kiwi and weka protection zone. 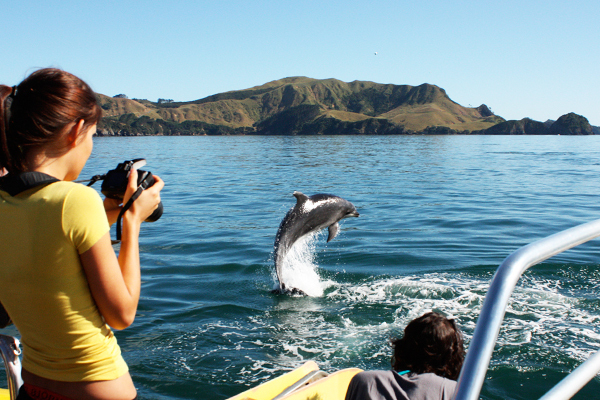 Russell – Orongo Bay Holiday Park is a central base to discover the magic that is the Bay of Islands. 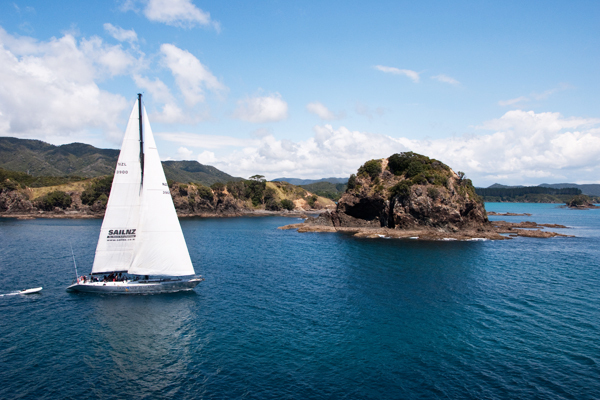 Ask us about things to do in Russell and the Bay of Islands – don’t rush, take your time and relax and enjoy this very special holiday destination. 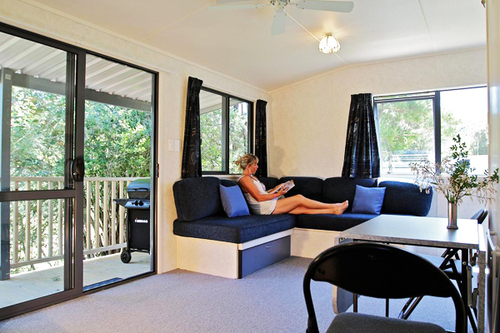 Have peace of mind that you will be staying at a Holiday Park that is Eco Wise. We also have plenty of parking for cars, campervans, boats, coach & bus as well as boat and carwash facilities. We have plenty of off street parking for cars, campers, boats, bus's, coaches and trucks! 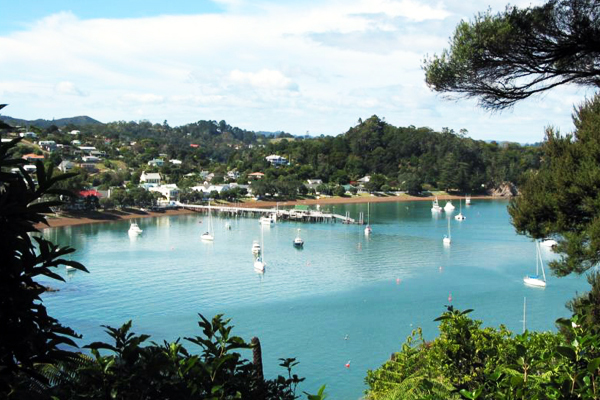 We are the ideal base for Bay of Islands tours, fishing, beaches, walks, galleries, cafes, restaurants, and heritage sites. 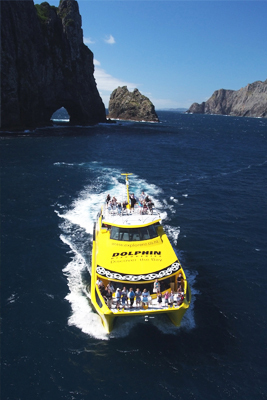 Dolphin, Hole in the Rock and Bay of Islands cruises and tours depart from the Russell Wharf, as well as passenger ferries to Paihia. 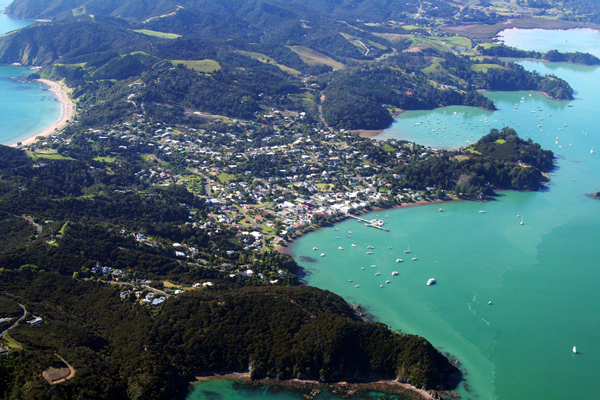 Located on the Russell peninsula in the Bay of Islands, you can find how to get to us by clicking here. Full payment is required at the time of booking. Your booking is not confirmed until full payment has been received. Contact us for other payment options. Payments are non-refundable if cancellation occurs within 30 days of your booked date. A cancellation fee of 20% of the booking cost applies to all bookings. For the peak Xmas/New Year season, full payment is required by 1 November and is non refundable from that date. Children are 2 to 14 inclusive. Children aged 14 and under using the swimming pool must be supervised by an adult or a person aged over 14. Children aged 8 years and under must be supervised when using communal bathroom and other facilities. Arrival Time: 2 pm. Departure by 10 am on the day of departure. Accounts - We ask for payment prior to arrival. If there is a balance to pay, this balance is payable on arrival. Payment must be made for the full time booked. We do not give refunds for early departure. However in exceptional circumstances the balance of accommodation not used can be used up at a later time, subject to availability and at the manager’s discretion. Opening hours are 8 am to 7 pm from 1 October to 30 April and 8.30 am to 6 pm from 1 May to 30 September. The pool is open from Labour Weekend until the end of Easter from 8am until 8 pm. No glass, food or animals are permitted inside the pool fence. Children using the pool must be supervised by an adult. Vehicle speed in park is limited to a walking pace only. Reasonable quietness between 9pm and 7am is required. Reasonable behaviour and dress is required at all times. Consideration must be shown at all times to other guests. Guests will be told to leave with no refunds given if their behaviour does not comply with Park Rules or disrupts other campers. Alcohol is only permitted to be consumed on your allocated site. Alcohol is not to be consumed within the pool area or walking around the Park. Excessive drinking and parties are forbidden. Russell-Orongo Bay Holiday Parks takes pets, except from 20 December until 7th January, following prior arrangement with the management. Please place bottles, cans, paper and cardboard in the appropriate container at the recycle stations. Please remove bottle tops and preferably squash plastic bottles before sorting and disposing of bottles into the correct clear, brown and green recycle bins. Please place food scraps in the compost bin. Please sort and place drink cans and food tins into the appropriate bins. You will find one recycle station beside the roadway adjacent to the pool. The other recycle station, which is used during the peak times, is in the tent field. The fish cleaning and smokehouse area is on the north side of the tent field. Please clean and fillet fish in the smokehouse. Wrap scraps in newspaper and place in the camp bin. No filleting in the kitchen or cabins please. No storage of fish or bait in camp food fridges or freezers. Boat motors may be washed only in the designated area which is on the north side of the tent field adjacent to the fish cleaning and smokehouse area. Please be considerate of other campers while washing your boat. Visitors are allowed by prior arrangement with the Park management. All visitors must report to the Park Office before entering the park and must depart before 9pm. Visitor’s vehicles are to be parked in the parking area adjacent to the Park You are responsible for your visitors including their behaviour. Children under the age of 5 should be accompanied by an adult when using toilets and showers. Hand basins are not be used for washing clothes. Please leave them clean. The amenities blocks are closed while cleaning is taking place, usually between 11 am and 1 pm and more frequently when busy. The laundry is open between 7 am and 9 pm. An iron is available from the office. One vehicle only is permitted to be parked on each site. 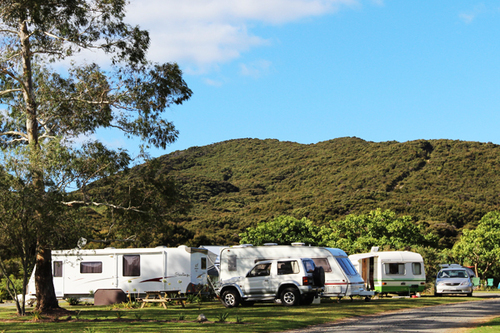 Caravans & campervans must have an electrical warrant of fitness and comply with LPG Standard (NZS 5428:1996). 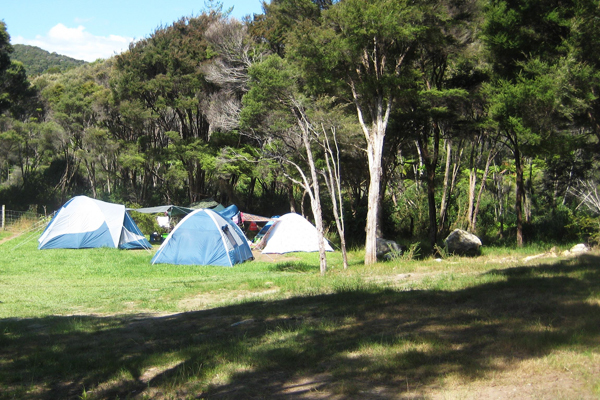 Tents: Electricity can only be connected through an approved isolating transformer or RCD Safety Switch. Smoking is only permitted at certain allocated smoking areas within the Park. The dump station is behind the ablution block. All campervans and caravans must have their own grey wastewater container. Chemical toilets must be emptied in the dump station. The camp water supply comes from a local spring which is filtered and uv treated for your safety. In busy times a bore is used for back up. In the interests of sustainability, please use water sparingly. Open fires within the camp are not permitted. No fireworks are permitted in the holiday park as they have the potential to cause danger or damage. 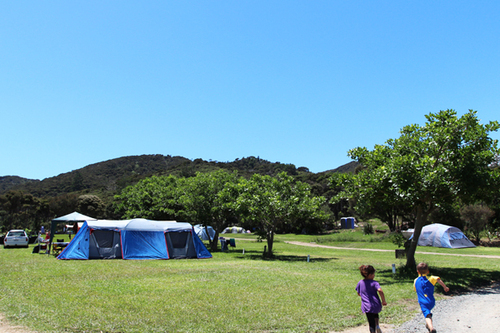 Please position your tent to allow your vehicle to be parked on your site. Prior to vacating your site please ensure that all pegs are removed and that the campsite is left in a clean condition. Please leave the kitchen clean for the next camper. Food in the refrigerator and freezer should be named and dated. Our policy is that food which is not named and dated will be thrown out. The kitchens and amenities area are closed while cleaning is taking place, usually late morning. 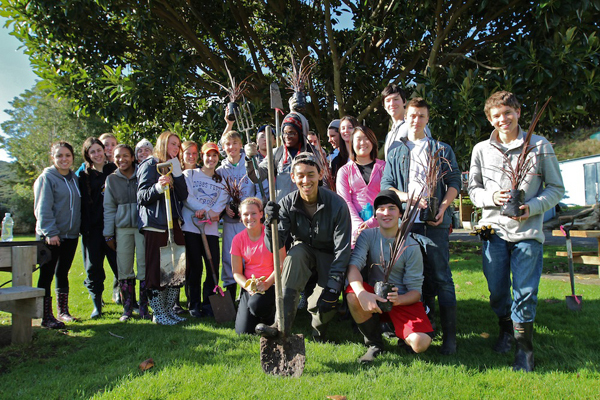 Any damage to Park property will be charged to guests including damage caused by their visitors. The park owners shall not be responsible for any loss, theft or damage of any guest’s property for any reason, including any fault pertaining to any fitting, appliance or piece of apparatus within the vicinity of the camping ground. Management reserves the right to request any camper to leave the camp for infringement of rules or disruption to other campers. Booking and occupying accommodation at Russell – Orongo Bay holiday Park implies acceptance of the above rules and conditions by the site holder/occupant.